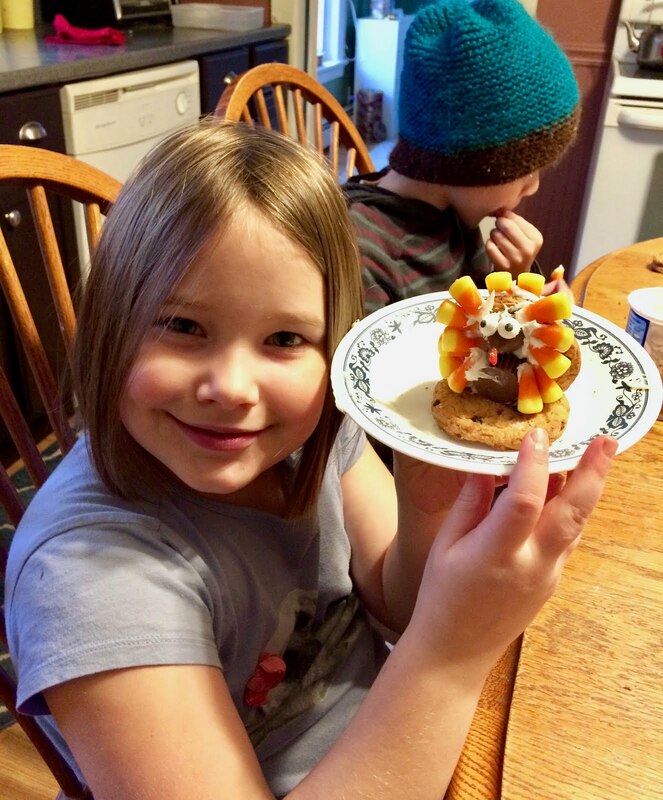 Home-Cooked & Handmade: Fun-to-make Turkey Treats! 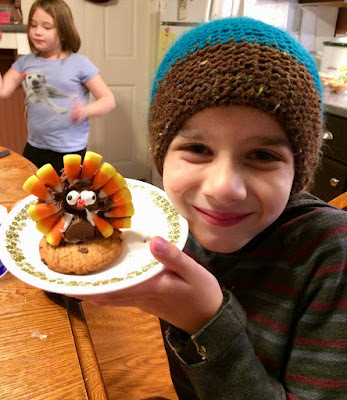 Last year, not long before Thanksgiving, my kids got together with their good friends and created some delicious treats. The turkey cupcakes we had made a version of in a previous year, but the turkey cookies were a new idea altogether. I found the idea for the cookies in a magazine. We started with the cupcakes, as I knew those would be the easiest to construct. The kids all got a previously baked cupcake, their choice of vanilla or chocolate frosting, candy corns and Wilton candy eyes. We all shared a tube of red gel frosting. The cupcakes needed little explanation. I just showed them an example and they easily put the turkeys together. Each cupcake came out a little different, but I'm sure the kids would tell you they were equally delicious! Bake cupcakes according to package directions. Cool completely. Frost with chocolate frosting. Decorate according to picture above and enjoy! If you have a kid who loves to bake, boxed cake mixes are a great place to start them off with following directions. If you want to make it quick and easy, you can have the cupcakes prepared ahead of time. After they had made their cupcakes, the cookies took more explanation and help. Once I showed them how to make one, though, they caught on. With a little frosting and some perseverance, the cookies turned out great. Funny thing is, they lasted only a few minutes. The kids ate up their work right after it was done! At least I got pictures! For each turkey cookie you will need two store-bought chocolate chip cookies. Cut a small piece off one so that it has a flat edge. Place the uncut cookie on a plate. Frost the cut edge of the cookie you just cut and affix it to the uncut cookie so that it looks like a chair. Next take a miniature Reese's peanut butter cup. Open it and cut off part of the side as shown in the picture. Frost the front and cut edge of the peanut butter cup, turn it around and affix it to the cookies. Then take a Hershey's Kiss and frost the back. Stick it to the upright cookie. Now, gather 14 candy corns. With a knife spread some frosting on the tips of the candy corn and affix 12 in a semi-circle around the upright cookie. These are your tail feathers. Then take two and attach them, as shown, to the side of the peanut butter cup. These are the wings. Then you will stick on the eyes to the Hershey's Kiss with some frosting. After you have done that, pipe on the red gobble, orange beak and turkey legs. Now you have a cute and delicious treat! *For either of these recipes you can substitute homemade ingredients. You can use homemade cookies for the turkey cookies. You can also use homemade cupcakes or frosting. It's totally up to you! Great way to keep kids entertained on a rainy or snow afternoon - cup cakes, candy corn, a couple of cans of frosting - probably should be fall stables in any household with children. I would use yogurt covered raisins for eyes - just to slightly simplify. Yogurt covered raisins would definitely work. Good idea! Those are adorable! It looks like they would be easy enough that children can help. Thanks! The kids all made their own. You can see they all turned out a little different. They lasted only long enough to take pictures. Then they were eaten! Can't wait to make these with my kiddos! Trying to do more of this stuff before they stop wanting to do them! My kids never seem to get sick of these. I made gingerbread houses with my family until I was an adult. Now I still do it with my kids. I never got sick of these kind of things. I just might eat the candy corns before the Turkey gets made! Fun idea! LOL! It won't take too many candy corns. You can eat most of the bag! I Made it Through the Ultimate Blog Challenge! Why a Another Cooking and Craft Blog? Homemade Halloween 1980s Style, Baby!